Aeneas Wilder: Writings Give me some truth: Observations and reflections during travel in Italy, Novemver 2017. Funerary mask of Filippo Brunalleschi, 1447. Museo dell’Opera del Duomo, Florence. Due in Milan on a Saturday afternoon, courtesy of an Easyjet booking made months in advance, I arrived in Malpensa Airport to lashing rain and the sudden knowledge that no one I had hoped to meet over the weekend was in town. Not having had my “art fair” radar switched on for some years now, I was unaware that Artissima was taking place in Turin, drawing dealers, collectors, gallerists and artists from all over Italy and beyond. However, by the Sunday evening it was all over in Turin and by Monday my amended schedule was back on track. Fortunately, I was able to meet up with Alberto Fiore, assistant director at Galleria Raffaella Cortese, who did mention that sales at Artissima had been good for the gallery. While enjoying an aperitivo together at La Ringhiera, Alberto was horrified to hear that I was (in theory at least) considering fixing my work together. The theory being that a museum or collector might actually buy one of my installations. Well, it could happen. He told me that my work is primarily about truth. Truth having gone out of fashion some time ago, Alberto’s words helped me understand why I have been skint all these years. Neck and Albatross. "(R)EVOLVE by Baptiste Debonbourg, presented as part of the group exhibition Tensioni Strutturali #3, Eduardo Secci Contemporary, Florence. Arriving in Florence, Eduardo Secci was telling me that things could have been better for his artists at Artissima. As the only contemporary art space in Florence and with a focus on installations it is not just truth that is hard to sell, it seems. My initial idea of gauging an artists lot in Italy was beginning to seem redundant. Basically, the situation for artists, more or less, is the same the world over. We are all pursuing an ideal, a conviction or a vocation and only the very few have any security and wider recognition. I wondered if a recent report outlining that 0.7% of the world’s population hold 46% of the worlds wealth was mirrored in the art world. Is it perhaps only 0.7% of the worlds artists that hold 46% of the wealth and riches that can be bestowed on an artist through the sale of their work? I read somewhere, sometime ago, that back in the day Michelangelo’s wealth was the equivalent of $30m in today’s money. Still, lets not get bogged down with financial insecurity. Italy is always a pleasure, even if you do discover the electronic loss of €48, thanks to a tech savvy pick pocket’s preference for the contactless payment system. Next time you are in Florence, I would like to recommend the Hotel Bijou. It is a lovely spot, located just a few minutes from Santa Maria train station. My room had a ceiling height far in excess of it’s length or breadth, a tiled floor and a fold down camping bed, giving one the feeling of incarceration. Escape however, was easy. The hotel has a rooftop terrace, obtainable via an additional key, held at reception. I think you would be hard pushed to find a bad rooftop view in Italy and the views out to the Fiesole foothills, as an orange moon rose into view, were spectacular. Although Brunalleschi’s dome is totally eclipsed by the Basilica di San Lorenzo, it is still a very pleasant place from which to contemplate the city and an artists relationship to it. On a subsequent rooftop visit I encountered a beautiful display of alarmed house sparrows. It would appear that Florence is infested with them. As dusk fell, there were many thousands, flying overhead in agitated swarms and clusters. Watching these birds in flight made me think again about the artists of this world. Exactly how many artists are there are in the world? It must be many millions. Florence was a fitting place to see these birds in flight as it allowed me the association with the countless myriad of artists out there, finding themselves within a swarm or a cluster, always moving with dramatic or subtle changes of direction. Lets call them the 99.3%. House sparrows apparently never glide, they always flap. If the purpose of the electronic screeching and wailing that emanates from the parks of Florence around 5pm each evening is to set the birds to flight until they exhaust themselves and subsequently die, then I did wonder if the association with artists still runs true. Eventually, as an artist - and after a lot of flapping - you will die. You will drop out of the sky. If you are lucky, your work will be kept somewhere for posterity, much like the arts and crafts that adorn the Museo del Bargello. Posterity would bless your work with far more information than is to be had from, for example, a 15th-century jesters cudgel. There is a lot of great stuff in the Bargello but that particular work caught my attention this time round. Here were the remnants of someone’s work but whose name was now gone. For me, having ardently studied sculpture, the Museo dell’Opera del Duomo is something of a Mecca. 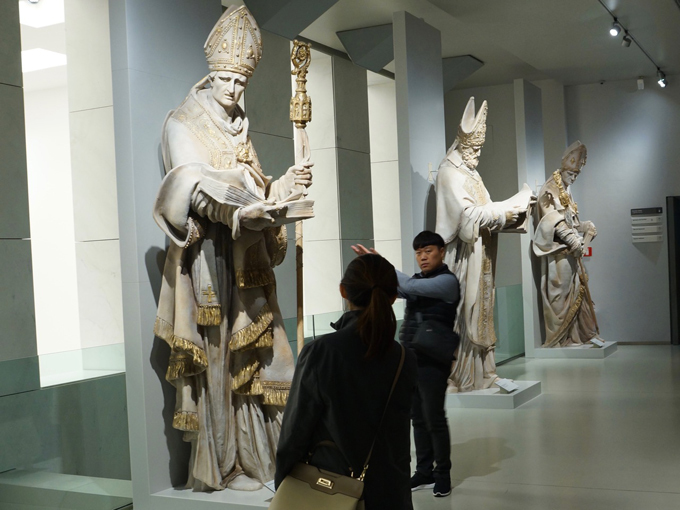 Although the juxtaposition of these classic works with the contemporary world was on my mind already, while visiting I was able to easily picture Charles Ray’s work in three oversized papal figures, dressed in their imposing robes. Twice life size they towered over their viewers. 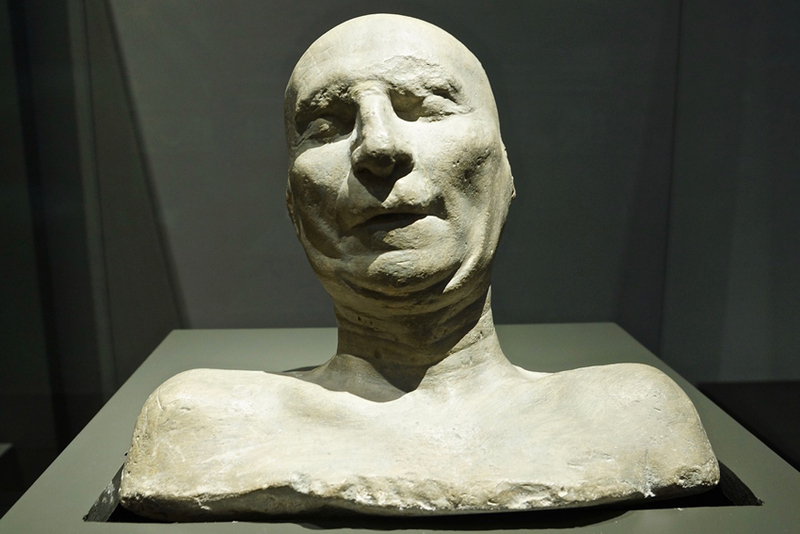 Amongst the many great works on display there is also a funerary mask of Brunelleschi. 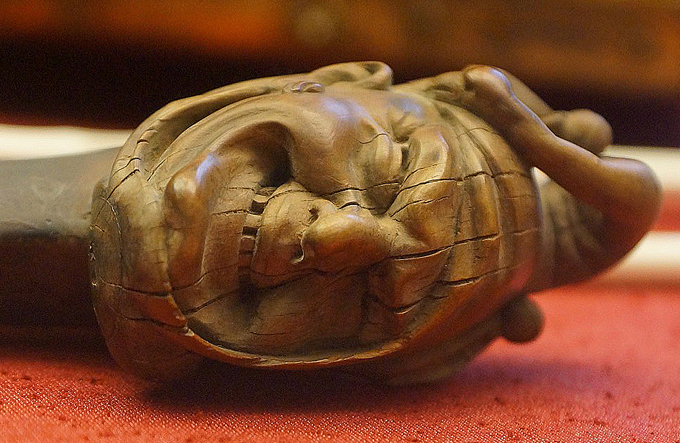 This five hundred and seventy two year old artefact had me immediately thinking of Bruce Nauman. My museum ticket included a trip up the interior of Brunelleschi’s dome and also a step inside the cathedral’s baptistry. Walking around the interior galley of the cathedral dome is perhaps as close as one would like to get to fire and brimstone. There are a few naked figures contemplating their disemboweled innards up there. 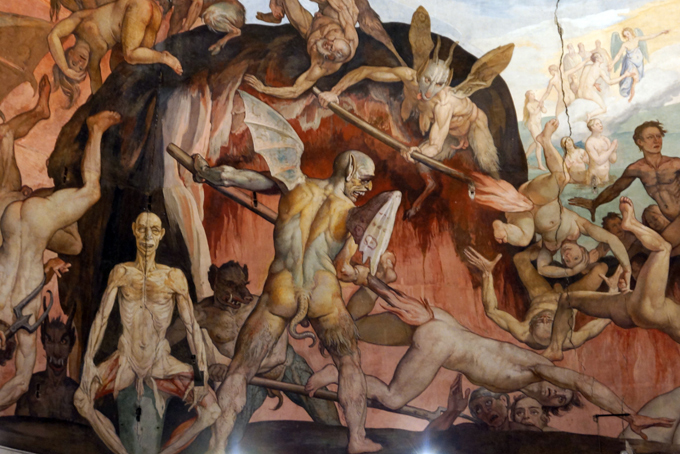 I could see the essence of The Chapman brothers in that frescoed depiction of hell. Back on terra firma, even the floor tiling of the baptistry had more than a hint of Bridget Riley about it. Frescoed interior ( detail) of the catherdal dome, Florence. 16th-C. Taking the train from Florence to Lucca I went to visit the curator Angel Moya Garcia at the Associazione Culturalle Dello Scompiglio. As an introduction to each of their publications their text states: “This private project presents indoor and outdoor visual and performing arts, with dialogue and interaction related to the earth, woods, animals and architecture of the estate in which Dello Scompiglio is located”. Angel was keen to point out that, as a private, independent organisation, Dello Scompiglio has the opportunity to present projects freely. All creative decisions are ultimately made by the director Cecillia Bertoni. There are no committees pushing certain projects or agendas. There is no state funding. The need to justify the allocation of funds, to a board of directors or auditors does not apply here. As a Spanish national working in Italy for some years now, Angel’s experience was that it can take months or years to finally get clearance for publicly funded projects in Italy. Dello Scompiglio can make project confirmation quickly and can then use the months, or years, to fully plan a project unhindered by local, regional or national policy decisions. 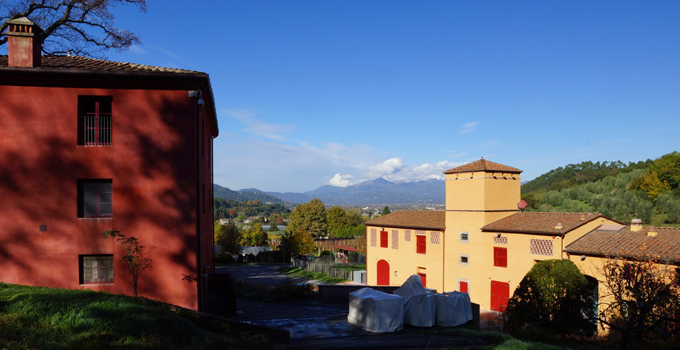 Administrative building on the left, cultural building on the right, Dello Scompiglio, Tuscanny. The organisation presents contemporary dance, performance and visual arts projects alongside a committed educational programme. With addition income from the production and sale of olive oil and wine from within the grounds, a certain amount of independence is guaranteed. The food served in the restaurant is delicious, modestly priced and popular with local farmers and nearby industrial estate employees who frequent the place during weekday lunch times. Any profit made here goes directly back into the foundation. In addition to the restaurant, Della Scompiglio is comprised of a number of renovated buildings that house a theatre, conference room, two small gallery/exhibition spaces, a library/bookshop for in-house publications and educational research material as well as a vast underground gallery/installation space and residency accommodation for up to 20 people at a time. Projects are usually developed around a central theme. This past year it was gender issues, next year will explore the rituals surrounding death in various cultures around the globe. Arriving in Perugia I was met off the train by the artist Arthur Duff. He has been living in Italy since the age of nine. His studio and family life are in Vicenza though five days each month he works at Accademia Belle Arti Perugia, running the sculpture department for the 1st, 2nd and 3rd year students. His colleague and fellow artist, Nicola Renzi, oversees the painting department and the MFA programme. Between them, and with the understanding of their director, they are bringing the fine art department out into the social, cultural and economic fabric of the city. The fine art department is keen to work with local businesses and has a gallery space in the city (a glass fronted former shop) were 3rd year students are encouraged to present new work. Close by the train station there is a digital printers workshop/production space, set up by former students, where both students and paying customers can produce any number of forms, structures and bit parts. They have five machines available for this as well as a studio space, and a technical drawing and planning area. My intention in visiting Arthur was to again get an insight into the professional situation of artists in Italy. And again it would seem that it is much the same as elsewhere. There is a limited and small market for art amongst collectors and institutions in Italy. Arthur did presented a text based laser work during the Venice Biennale in 2013 and does have the good fortune of the occasional collector buying his work. However, if you have a family to support, rent to pay and your practice involves - for example - text based laser projections, it is never going to be easy. This isn’t a sob story, simply reality. If you are bringing up a family and not part of the 0.7%, you will know this already. The thing that made the biggest impression on me during this part of the trip, was the recognition, from both Arthur and Nicola, that this“chance visit” could be beneficial, not only for the students and the academy but also for the visiting artist. 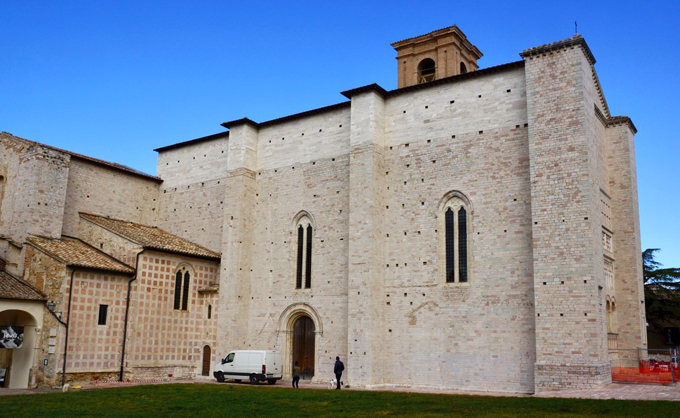 Basilica of San Francesco al Prato, Perugia. I had an informal discussion with MFA students, on the subtleties and practicalities of my work. In addition I was greeted with warmth by the administrative staff and given encouraging nods from the fine art principle while Arthur explained who I was and how I could perhaps come back and produce an installation for their soon to be completed project space/ auditorium, the basilica of San Francesco al Prato. A typical cross shaped church dating back to the 13th century and now devoid of any religious markers, it has a floor space 80m long with a height clearance of 20m. It is difficult not to contrast the academic warmth and enthusiasm in Perugia with that of my former post graduate year at Edinburgh College of Art all those years ago. Common sense is telling me not to open that can of worms, but the albatross round my neck keeps tugging. Therefore, it is worth reflecting a little on my own student days as they have determined my career choices ever since. Back in 1993, I had been headhunted by Edinburgh College of Art to join their two year MFA in Sculpture. Some months into the course I attended a Sol LeWitt opening at the Fruitmarket Gallery. Although Edinburgh is my home town, I knew no-one at the opening except my appointed professor, standing with his all male department colleagues. Naively, I thought to join them and say good evening etc. The first words of my professor were “Look at the rear end on that sculpture there”. Slightly confused as to what he was referring to, my uncertainty turn to visible disgust as, after his fourth repeat of that phrase, I realised his persistent interest was directed towards the young woman (probably an intern) walking around the exhibition with a complimentary tray of wine. Come the following June, my MFA had been cut short with no forewarning and I was dismissed as “not a serious artist”. The fact that my horror had been visibly present in the Fruitmarket Gallery may have played some part in my academic demise as, no doubt, did my subsequent inability to feign respect for my superiors. Out in the cold, I spent the next four years on my studio practice (proving to myself that I was a serious artist?) while my career went nowhere. Back in those pre-internet days, any opportunities that arose for artists in the Edinburgh area would be coveted by Edinburgh College of Art. A residency in Norway in 1998 meant that I was suddenly being treated as a professional by my peers - in Norway at least. I made several subsequent trips there for residencies and exhibitions and from that time on I never looked back. Over the past twenty years I have worked and exhibited in The Netherlands, Belgium, France, Italy, Switzerland,The Czech Republic, Portugal, Canada, The USA, South Africa, Iran, India, Thailand and Japan. In many of these countries I have exhibited multiple times. My 14th solo exhibition in Japan will take place in May-June 2018. Without international opportunities I may very well have fallen out of the sky many years ago. With an uncertain future and the very real possibility of the UK becoming culturally isolated, now is the time for visual artists to forge or strengthen links to mainland Europe. I suspect that it won’t be so easy after the 29th March 2019. As an example: a non EU citizen, being paid for work in Italy, is currently subject to a 30% Italian income tax for non EU domiciles - the 30% deducted at source. Obviously, this does not apply if you legally reside in Europe and can therefore prove that you pay income tax in your European country of residence. From the 30th March 2019, if you are based in the UK, you will also be subject to HMRC’s 20% income tax on the profit you have left after your paid work in Italy. Not known for my “glass is half full” outlook on life I will try and end here on a high note: Brexit - the gift that keeps on giving.